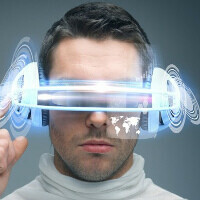 Virtual reality and VR headsets are a pretty hot topic right now. It seems that almost all of the more popular smartphone slingers either have or are rumored to be working on virtual reality headsets. Even Apple. One of the latter's major rivals, Google, has already made its baby steps in the VR field with the Cardboard VR headset, but it looks like Mountain View might be prepping a much more interesting one as we speak. Rumor has it that Google could be secretly working on a standalone VR headset that won't rely on a compliant smartphone to work. It might not require a PC or any other smart device either. This would make this rumored gadget a pretty innovative one, as most current-gen VR headsets are not approached to as standalone devices, but more as accessories and functionality extenders of our phones and computers. In order to be independent, Google's VR headset will need to come with a full hardware package. This means that it must have its own processors and sensors - the rumor mill tells us that these might be supplied by Movidius, one of the major manufacturers of motion chips and high-performance computational imaging devices. Additionally, Google's VR headset will certainly have its own display and will most likely employ a set of outward-facing cameras. That's everything the rumor mill has come up with so far. As far as design and price are concerned, we know nothing so far, but one thing's for sure - it won't be as dirt cheap as the DIY $20 Cardboard VR headset. Rest assured that we will keep an ear close to the ground for additional info on Google's VR headset and if something pops up, we'll get back to you as soon as we can. "but one thing's for sure - it be as dirt cheap as the Cardboard VR headset" yeah uh...how? it "won't" be as dirt cheap as the Cardboard VR headset. Peter forgot the "won't"
That's what I figured but damn...proof read much? NerveGear and AmuSphere are still connected to a computer or a system of some kind. Yeah because the game is on the computer. Real life nervegear will just be better. I wonder how they are going to market it, cheaper then vr that uses phones, phone price + google cardboard price? since it would be dedicated to vr so cheaper then that, but would basically do the same? Oculus Rift is a dying project because it's almost exclusively a geek toy needing high end gaming PC hardware, so hopefully Google, Sony, MS, Apple etc can bring it into the mainstream. Google starts working on a "first of a kind standalone vr headset"? Oh, like the Microsoft Hololens unveiled over a year ago. It is by definition, not first of a kind, Microsoft beat them to the punch. Except that Hololens isn't a VR headset which means you're 100% wrong or so. I would LOVE Google to bring this out, but only with AMOLED screens and preferably 4k resolution. I misread, I thought it was AR, not VR. And 4k resolution panel in front of each eye is minimal resolution, 2k like the Gear VR is terrible.